So you’ve just received your Pixieset online gallery...now what? Here is a detailed step-by-step tutorial on how to navigate through your Pixieset online gallery. Couples will receive an email from us inviting them into their Pixieset gallery. All of our portfolios are set to private and require a password for viewing. Your password will be found at the bottom of your email invitation. 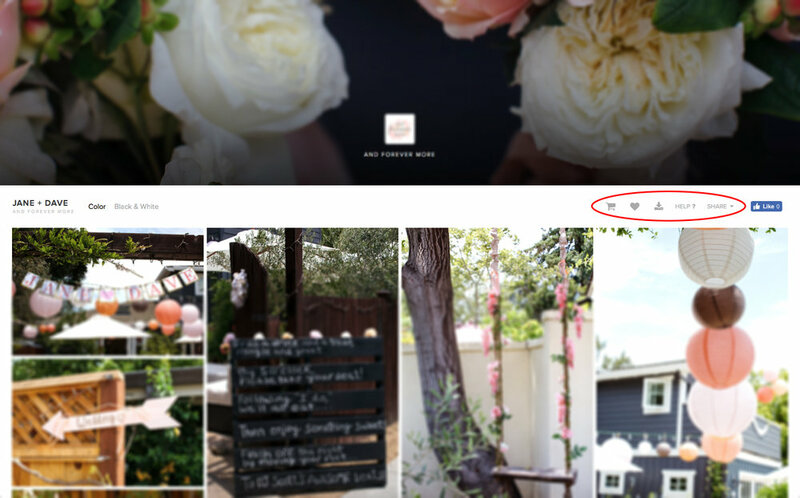 Simply click on the “View Photos” button and you will be redirected to your gallery home page. Enter in your password to unlock your gallery. Feel free to share the gallery password with family and friends. Anyone you wish to invite is welcome to order prints/canvases, or simply scroll through the photos. After you’ve entered in your gallery password, you may now scroll through your wedding day/engagement photos. We offer clients two copies of each photo. One version is a color copy while the other is a black and white copy. By clicking on ether “Color” or “Black & White”, you may view/order any of the variations. There are four other important buttons found at the top of the gallery. The first is a shopping cart icon (where you can see what all is in your shopping cart), a heart icon (where you can view all of the photos you’ve favorited), a download button (where you can download the entire gallery of images), and the share button (which allows you to share the gallery on any social platform of your choosing). Click on an image to enlarge the photo. There are several unique features found at the top of the selected photo. Share – By clicking “Share”, you are able to share the selected photo on your social media. Slideshow – Start a slideshow on your viewing device. The slideshow will begin with the selected photo and transitions to the next numerical photo. You cannot randomize the slideshow or change the speed of it. This feature is a great way to present your wedding/engagement photos when you have company over. Favorite – Click “Favorite” to add the selected photo to your favorites tab. You can view all of your favorite photos by clicking on the heart icon found at the top of the gallery menu (see gallery navigation). Download – You are able to download a single photo by clicking on the “Download” button. An email is required when downloading photos (see gallery navigation to learn how to download the entire gallery of images). Buy Photo – Pixieset allows users to buy high quality prints with the click of a button. By clicking “Buy Photo”, you have access to purchasing prints, canvases, or mounted prints. Each option varies in size and price. Transactions are completed through PayPal. All sales are final and are for non-commercial use only. We hope this tutorial helped clear up any confusion you had. If you are in need of further assistance, please email us your question(s) and we’d be happy to help. Our goal is to make our photos more accessible for everyone. Enjoy this new feature! Click HERE to view our Pixieset account.